The title of Mark Thompson’s corporate speech “Building a Winning Team” really is a good description of what this man has represented throughout his incredible career as both AFL player and coach. After a very successful playing career at Essendon that saw Mark play in 3 premiership teams including captaining the 1993 Premiership team, Mark went on to forge one of the greatest AFL teams of the modern era. Geelong football club became the bench mark for the entire completion, featuring in 3 successive Grand Finals during his tenure and winning flags in 2007 and 2009, the Cats and Thompson’s coaching techniques quickly became the envy to all. 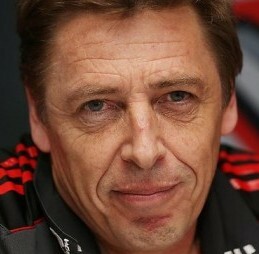 In 2011 Thompson returned to his beloved Essendon Football Club as the senior assistant coach and on 10 October 2013, he was appointed the senior coach for the 2014 season. Affectionately known as Bomber, Thompson also became a favourite with the media while coaching, often showing his lighter side during press conferences. Mark is now very much in demand as a corporate speaker and helping companies build their own winning team! Maintaining a winning team through a crisis.